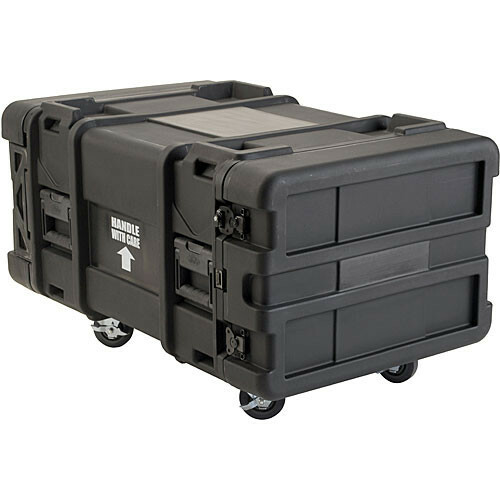 The SKB 3SKB R906U30 ATA Roto-Molded Shock 30" Rack Shipping Case is a six unit 30" deep roto-molded case. Features include compound hinged doors, black, powder-coated, stainless-steel latches, removable 4.0" casters, eight HM-245 elastomeric shock mounts with a load range of 40 to 150 lb., gasketed doors and a pressure relief valve. The case meets most ATA or military specifications for shipping cases. Roto-molded polyethylene shock-absorbing rack case. Standard rack depth front to rear rail is 30" and lid depth is 4.5"
Frame with threaded steel rails and aluminum cross components form an "H" shaped rigid configuration. Eight HM-245 elastomeric, high damping, wide temperature range, shock-mounts with a load range of 40-150 lbs. Plug style lid sealing system. Lids penetrate the body with an approximate 1.0" molded in protrusion that provides sealing and anti-shearing properties. Compound hinge system allows the lids to swing out 270° and rest along sides of the case or easily removed and reinstalled. Cases stack securely with wheels on or off. Both lids can be opened while cases are stacked. Standard high-quality slide-in/out locking swivel 4.0" locking casters rated at 1200 lbs. Box Dimensions (LxWxH) 42.0 x 26.5 x 20.5"